IT’S ALIVE! is Larry Cohen’s magnum opus. This drive-in classic about a mutant killer baby keeps its tongue firmly in cheek while relating the saga of Frank and Lenore Davis (John P. Ryan, Sharon Farrell), whose newborn child is a freakish monster that goes on a killing rampage. The beastly bambino slaughters the entire OR staff and escapes the hospital. The cops vow to “exterminate” this demon child for the good of mankind. A University professor (Andrew Duggan) wants the baby’s corpse for study, but a pharmaceutical exec (Robert Emhardt) wants it destroyed. It seems the drug company’s birth control pills contributed to the horrible mutation. The little bundle of terror eludes the police, murdering any threats in its way. It makes its way home, and momma Lenore hides it in the basement. 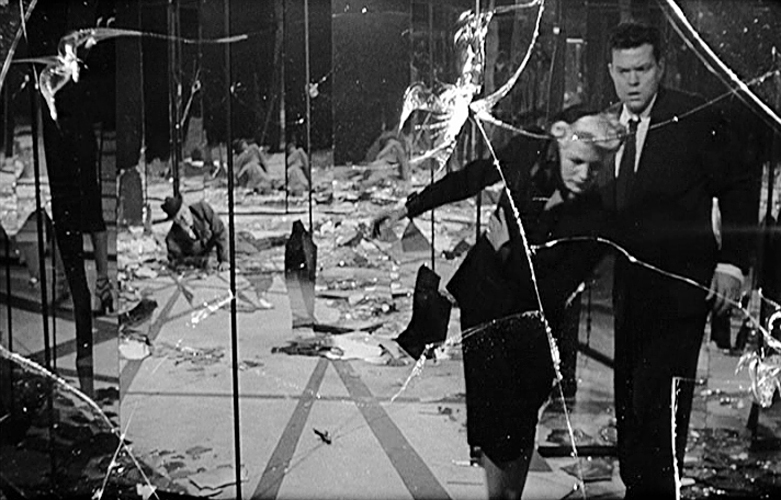 Frank finds out and, with the cops help, aims to destroy it himself. 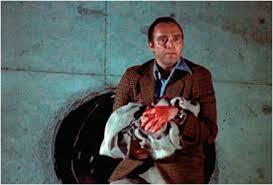 The chase ends in the sewers of LA, where daddy Frank can’t bring himself to kill his mutant offspring. Emerging from the sewers with his beastly baby, the cops end up blasting it, ending the menace of the killer baby once and for all. Until they get a radio call that “Another one’s been born in Seattle”…. Larry Cohen got his start as a television writer, including 43 episodes of the 60s sci-fi series THE INVADERS. Making his directorial debut with the 1972 thriller BONE, Cohen turned to Blaxploitation with BLACK CAESAR and HELL UP IN HARLEM, both starring ex-NFLer Fred “The Hammer” Williamson. Then came a string of strange but interesting movies: THE PRIVATE FILES OF J. EDGAR HOOVER, FULL MOON HIGH, Q:THE WINGED SERPENT, and THE WICKED STEPMOTHER (Bette Davis’s swan song). IT’S ALIVE! spawned two sequels by Cohen, IT LIVES AGAIN and IT’S ALIVE III: ISLAND OF THE ALIVE. Larry Cohen is still active as a screenwriter, penning such fare as MANIAC COP, I THE JURY, PHONE BOOTH, and CELLUALR. IT’S ALIVE! was remade in 2008, but like most remakes it didn’t come close to the original. The cast plays it straight, with Ryan and Farrell particularly good as the beleaguered parents. Michael Ansara, William Wellman Jr., and Guy Stockwell also appear. The “baby” itself, which resembles the World Weekly News tabloid’s Bat Boy, was the creation of make-up wizard Rick Baker. Baker’s makeup and puppetry make Baby come alive. Hidden in the shadows for the most part, we only get glimpses of the chilling cherub. Veteran composer Bernard Herrman wrote the eerie score. 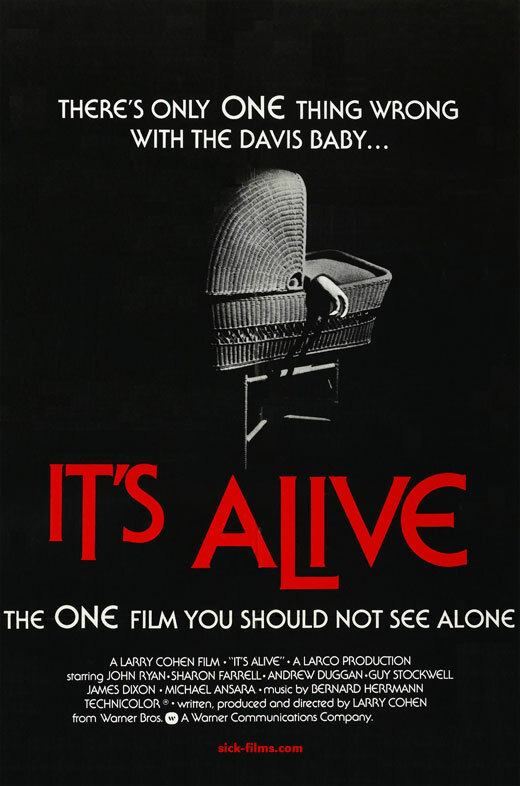 I’m a big fan of IT’S ALIVE!, having seen it upon release (at a Drive-In of course!). Your suspension of disbelief is required for this one. Sit back, grab some popcorn, and enjoy IT’S ALIVE! Well worth seeking out, so are Cohen’s other demented early films!! !